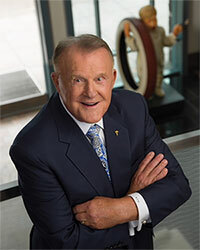 SCOTTSDALE, Ariz. (Jan. 4, 2018) – Discount Tire founder and company Chairman Bruce Halle passed away peacefully in his sleep on Thursday, January 4, the company confirmed. Bruce Halle is survived by his wife Diane, his loving children Bruce Halle, Jr. (Nikki), Susan Lyle (Wilson), Lisa Pedersen (Chris) and Michael Zuieback (Sheila); siblings Bob Halle (Nancy), Mary Ellen Merrill, Betty Lou Halle; and 7 grandchildren. At a young age, Bruce Halle knew the definition of hard work, as he helped deliver newspapers, cut grass and dug graves to help support his family during the Great Depression. Bruce is a proud Marine who served in the Korean War. Halle opened the first Discount Tire store in Ann Arbor, Michigan, in 1960 with six tires and no business plan. At the time, Bruce served as the tire technician, accountant, sign painter, toilet cleaner, customer service representative and any other position needed to grow the fledgling business. Halle established a simple business ethos: treat others how you want to be treated, always give the customer a good deal; surprise the customer with unexpected benefits like clean bathrooms, free snow tire changes or free flat repairs; build your customer base through word of mouth; and have fun. Over the years, Halle built the largest and most recognized tire store in the country, but never lost sight of his early years in the bay as a tire technician. A humble man, Halle shied away from industry recognition, preferring to give the credit for the company’s continued success to his employees and his long term experienced leadership team whom he considered family. The Bruce T. Halle Library on his alma mater campus at Eastern Michigan University is named after him. He was awarded an honorary doctorate from Eastern Michigan University and delivered the university’s commencement speech in 1995. A deeply spiritual man, Halle and wife Diane traveled to the Vatican and were knighted with the Order of St. Gregory for their contribution to chapel repairs. Over his lifetime, Halle amassed an unprecedented art collection of more than 400 tire-related lithographs, which are curated and on display at company headquarters. He graciously accepted induction into the Modern Tire Dealer Hall of Fame in 2014. Discount Tire holds the Guinness World Record for longest running advertisement, consistently airing since 1975. Giving back to the communities where customers and employees reside was a focal point of Halle’s leadership. He and wife, Diane, launched The Diane & Bruce Halle Foundation, a philanthropic resource for a broad range of charitable endeavors. Halle also created programs to benefit Discount Tire employees such as the Bruce T. Halle Assistance Fund, which provides financial assistance to employees in need, as well as the Bruce T. Halle Scholarship Program, which has awarded over 2700 scholarships for employees’ children to attend college. Discount Tire, the world’s largest tire and wheel retailer, will surpass 1000 stores in 34 states this year.